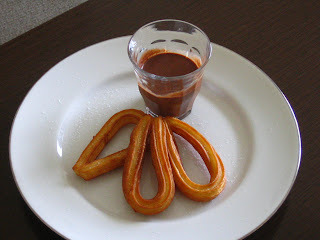 I’ve been meaning to write about churros con chocolate for a long time now since it’s one of my favorite things. I grew up eating churros almost every Sunday morning with my grandparents at a little Spanish pastry shop in Manila called La Cibeles that sadly, no longer exists. Now, the only place that still serves churros in Manila is Dulcinea but it’s not the same as it used to be. I haven’t had churros for ages but since we moved to Marbella a year ago, I’ve been tempted to indulge in my churros craving at least once a month. What are churros? They’re choux pastry piped straight onto hot oil and then fried till crispy. Similar to crullers, in Argentina, they are usually filled with dulce de leche (a sticky sweet caramel spread) while here in Spain, they are served plain accompanied by hot chocolate that’s meant to be used as a dip since it’s too thick to drink. – racion (portion) which is 4 cut-up sticks about 12 centimeteres long and perfect for one. Two places in Marbella’s Casco Antiguo (old town) serve churros – Ramon Churreria on the Plaza de Los Naranjos (Orange Square) and another just at the first small plaza on the way into the old town – Marbella Churreria. Both places serve the same thing, churros and hot chocolate, coffees and fresh fruit juices. Ramon Churreria was suggested by a high-school friend, Rica, who holidays in Sotogrande at her grandfather’s home. She urged me to go and try the churros there and I did many times. It’s a good place to take visitors who have never tried churros since the setting is picturesque. At Ramon Churreria, expect to pay a premium for sitting in Marbella’s main square amongst the many tourists and surrounded by the fragrant orange trees. Marbella Churreria was a recent discovery in the last year. It’s smaller and not as fancy and one I go to when I’m alone and just want a quick snack. I think both are very good but most days, I prefer Marbella Churreria because it’s simpler and usually filled with Spanish families having their churros fix. Of course, if you want to try and make them at home, you can too and here’s an easy churros recipe I read about on another blog called Market Manila . Although I have to say that there’s nothing like getting them from a churreria – hot, crispy and freshly-made. * Both are open daily from 10 a.m. to 1 p.m., close for the afternoon siesta, and reopen at 6 till 9 p.m.
Hi Entelechy,I'm so glad you're enjoying my churros recommendations. It would have been fun to meet up over some churros con chocolate but I've actually left Marbella (just 2 weeks ago) for Bali. Hope you enjoyed your Marbella holiday! Hi Dalal,Yes, churros are delicious! 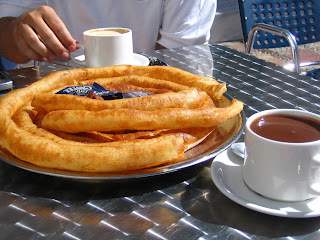 There are a few more places in San Pedro that also serve churros at half the price of the ones in Marbella -Churreria on Calle San Francisco off the pedestrian street and another one off the main square of San Pedro. Now, that you brought them up, maybe I’ll have some tomorrow morning. Yum!G.T. I love churros also!! I also had them at our hotel in Cuba. I guess it is a Spanish thing!! YUM! Now I’m craving some. I’ll definitely have to try some when I’m there.